These contemporary add-ons go their own way as they play off the style of the original. Owners of traditional homes who want to add on face challenges in integrating old and new. Eighteenth-century homes didn’t have floor-to-ceiling glass. Families in the 1930s weren’t particularly fond of eating outside, let alone cooking there. The original occupants of Arts and Crafts bungalows didn’t seek to live in light-filled homes with access to a swimming pool. And in the 1970s, large-screen televisions weren’t a design consideration. More fundamentally, houses built in previous decades frequently ignore views, light and gardens. Yet it’s often assumed that the best way to add on to your old house is to go with the same style, no matter how awkward the pairing. Buildings have changed over time, and putting a bit of woodwork on a basically modern construction doesn’t make it any more authentic. 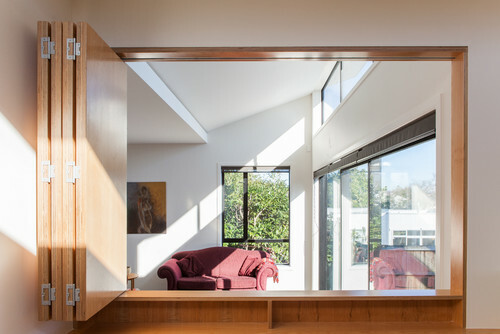 As these New Zealand houses show, another course of action is to respect what’s already there, while at the same time making your own mark with a contemporary addition. 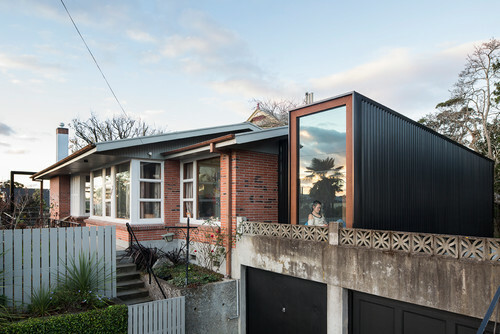 When the owner of this house outside Auckland, approached Paul Clarke of Studio2 Architects, it was to create a different sort of building out back. Clarke set out to respect the original house, seen in the background, restoring its white-trimmed wood windows and plaster exterior. Behind it, he built a two-story addition that contrasts with the original. “We inverted the house,” Clarke says. The old part is wood and painted white. The addition has a dark stain. The addition is effectively two boxes on top of each other. The top box is pushed slightly toward the garden, creating a veranda-like space underneath, while the downstairs is open and glassy, opening up to the lawn. Upstairs is a library, with spectacular views of the Waitakere Ranges to the west and Waitemata Harbor to the north. “There was that idea of peeling it back and seeing the bones,” says Clarke of the exposed floor joists in the addition, which contrast with the white-painted moldings in the original. The addition is a few steps down from the original house, so the kitchen and dining area flows seamlessly out to the deck and a rolling green lawn. Smith added a long, skinny room at one end of the house and a new outside area at the other, plus squeezed in an extra 2 feet along the back wall by taking it out to the eaves. But where the original house is brick, the addition is clad in black corrugated metal, and the additions are clearly legible, though still in scale with the original. And, as Smith notes, there are shades of black in the brick that are picked up by the new siding. The house had stayed virtually unchanged since it was built, with a lot of native rimu wood used throughout. “And we didn’t want to add to the rimu. It didn’t seem like a sensible thing to do,” he says. Instead, the additions are detailed in such a way that they relate to the original structure. In the kitchen, the cabinetry has slightly recessed fronts, in homage to how a 1960s kitchen might be. The architect also rearranged the inside of the house to make it more functional — most notably in the bedrooms, where the two former studies became bedrooms with huge sliding doors running out into the hallway. “They’ve claimed the hallway as part of their space,” Smith says. 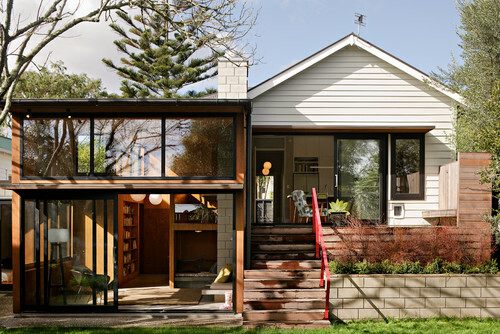 Simon Harrison of MOAA Architects radically transformed this small 1940s brick bungalow in Hamilton by adding a playful wood-clad box containing a study and small living area in front. The addition is obviously a new building — a key stipulation of the client — but connects to the original house in the most subtle of ways. The western red cedar fits nicely with the tones of the original Huntly brick, while the angle of the monopitched roofs is taken from the angle of the original roofline. In the entry, contractors carefully preserved the creeping ficus on the brick facade. White-painted window frames were retained in the original building; in the addition, they’re black aluminum. The addition is signaled here with the use of concrete steps leading to a wood deck. Unlike many of the projects seen here, the kitchen and dining area are contained in the original structure. Harrison reorganized the home’s original interior, which had been broken into a series of corridors and rooms that opened off one another. The redesign also gave the house a greater sense of distinction between private and public spaces, with four bedrooms and two bathrooms at the rear. 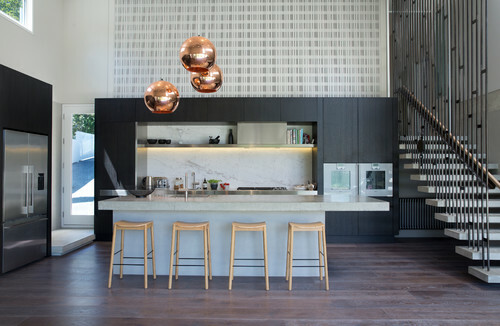 The clients asked for a series of interconnected spaces, rather than a strictly open-plan space, so the family could have spaces for cooking, reading and studying without interrupting one another. As a result, the rooms are intimate — here, the view is seen through shutters from the study into the new living area, which capitalizes on views to the west over Hamilton in a way the previous house never did. 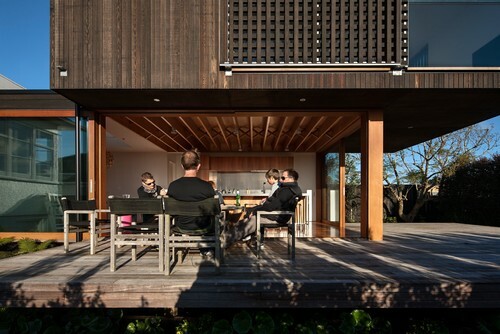 In Auckland, Pete Ritchie and Bronwyn Kerr of Kerr Ritchie Architects designed an addition for old friends on a small site. 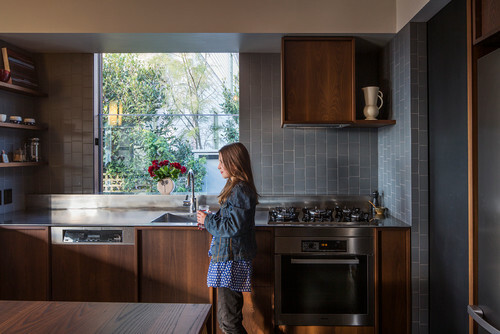 Initially brought in to design a second story to the 100-year-old house, they persuaded the clients that their money would be better spent reworking the rear of the building, which was a collection of old lean-tos progressively dropping in ceiling height. Although the addition is sympathetic to the original house in its use of wood and shiplap vertical siding inside, it is most definitely a new building. “We weren’t trying to disguise that this was a new part of the house. We wanted it to have its own identity,” the architect says. Large windows were a key part of that. Here, a window seat sits at the same level as the back lawn. The clients had already upgraded their kitchen. At the intersection between old and new, Kerr and Ritchie designed a floor-to-ceiling storage unit housing books, toys and collectibles. “We came to the conclusion that creating a better public space was more valuable than a nice private space,” Ritchie says. With this house, Gerrad Hall led a meticulous restoration of a much-altered Herne Bay villa (a pre-World War I clapboard house) in a heritage zone, which meant persuading council planners of the merits of his design. “It had a series of regressing lean-tos off the back and then an old laundry,” Hall says. “In essence we kept the main roof and tore off all the lean-tos." At the rear, Hall built a double-height addition housing a living room, which runs out to a large flat lawn and swimming pool. “I wanted to add a sense of permanence, and have a base to the back of the house that was concrete and tied into the ground, unlike what villas are: popped on the earth.” Hall then wrapped the top story in a slatted-wood screen, which subtly references the white-painted wood of the original villa. “Shifting the living area down to that lawn area made sense,” says Hall, who specified a restrained palette of concrete, dark wood and steel in the addition. This new section includes a second, sunken living area and a more casual family area, as well as a covered portico in a single-story addition that wraps around the lawn. The stairs at the right of this image lead down from bedrooms in the original house. Traditionally, you could look from the front door of a villa right down the hall and out the back door to the garden — something Hall restored by placing a large square window on the second level of the addition. Detailing in the original house is traditional, with white-painted wood, original polished floors, and classic baseboards and door frames. Council planners, surprisingly, were supportive of the distinction between old and new. 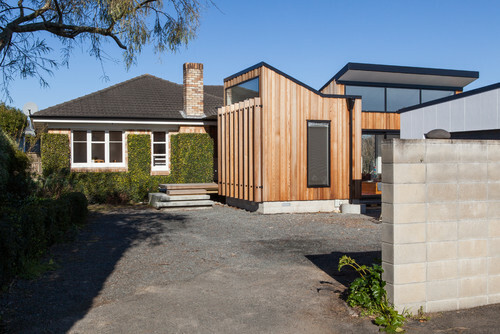 Dorrington Atcheson architects reworked a clapboard house in Westmere by adding a small north-facing section running out to a new courtyard. 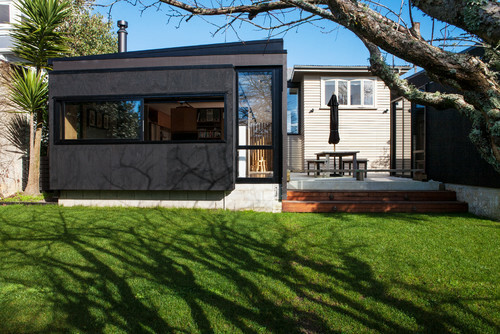 The addition is deliberately modern, built from band-sawn plywood stained black, with black aluminum trim. The addition connects to the original house via a glassy stairway. The original house now contains bedrooms, a big family bathroom and a second living area for the children, while across the courtyard, the original garage has been repurposed as a studio and music room. As a result, the new living areas are small but efficient, since the family can now spread out around the whole house. 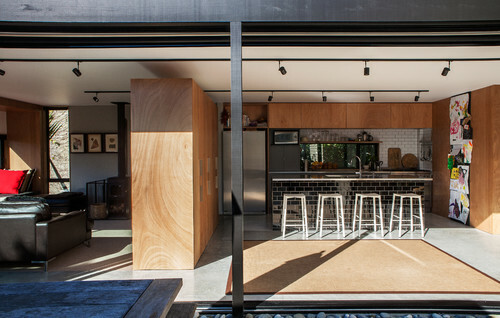 A plywood divider sits between the kitchen and the casual living room at left. 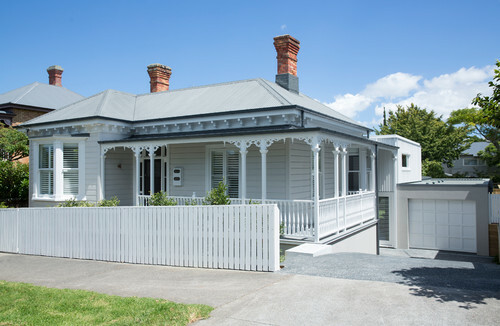 Previously, this villa in Mount Eden had little connection to its back garden. Megan Edwards designed a thoughtful, small lean-to with a double-height void, connecting the house to the garden via a ground-floor library and living room. A new deck and stairs with a built-in concrete planter box links the existing kitchen-dining area to the garden as well. 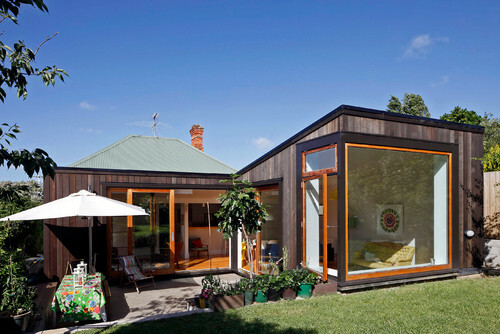 See Also from Houzz: Style Divide: How to Treat Additions to Old Homes? The existing house is a white-painted wooden villa. Edwards introduced a material palette of wood, concrete and ply in the addition, adding a distinctly midcentury aesthetic that makes it feel as if it has been part of the house for decades. Edwards slipped in a small workstation under the floor of the kitchen. Here, you can clearly see the level change between the old house and the new ground-level living room. Built-in seating around the new fireplace adds a cozy touch. 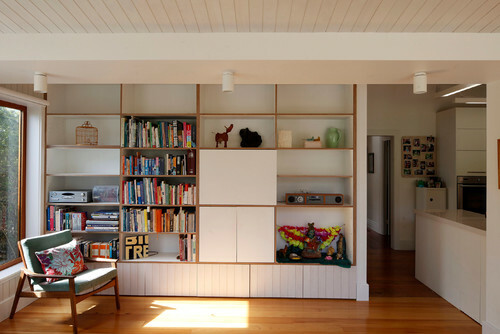 This article is from Simon Farrell-Green of Houzz.